no crying til the end! the mother series are my favorite RPGs ever. the stories, locations, characters and weirdness are what make me love it so much! the characters are some of my favorite characters in gaming, behind link from the legend of zelda and possibly klonoa or sonic the hedgehog! the first two games can be hard sometimes (they are late 80s-90s RPGs after all) but the stories make grinding and beating your head against a wall until you finally beat a boss or get through an area all worth it! below i will show screenshots, some random pictures and give some interesting information about all 3 mother games! MOTHER, also called earthbound beginnings and earthbound 0 is the first game in the mother series. it came out on the famicom (japanese NES) in 1989 but wasn't released in america until 2015 when it came out on the wiiu virtual console as earthbound beginnings. before then the only way you could play it in english was with a fan translation or from an extremely rare and expensive beta cartridge, nintendo was originally going to localize MOTHER but it never ended up happening. some people still prefer playing fan translations, or the 25th anniversary rom hack, over the official release on wiiu. i have an english fan translation cartridge of MOTHER1+2 so you could say i belong to that category! i plan on buying it on my wiiu though so im not doing anything illegal, as well as to support the mother series and hopefully get MOTHER3 localized some day! i haven't actually fully completed MOTHER yet, so i can't really say much story wise. along with figuring out the reason behind the poultergheist that attacked your house you also collect eight melodies throughout your journey, all tied to a specific object. as you can see on the side the first melody you get is from a baby doll your sister has that attacks you just before this part. MOTHER is a direct prequel to everything in the mother series after it, from afar they kind of seem like games that are similar in some ways but have different stories that don't connect but they do. MOTHER directly influences the events of mother2 and mother2 directly influences the events in mother3. it's not like final fantasy or something where theres different characters and stories but similar themes across the games, its all connected! ninten has asthma. when his asthma flares up he can't do anything in battle. in the official MOTHER encyclopedia, it says nintens favorite food is prime ribs, but if the reader has a different favorite food then that is also nintens favorite food. ninten is related to the final boss! his great-grandmother adopted and loved giegue (also called giygas), the final encounter and main villian of MOTHER. this is probably the game most people remember from the mother series, seeing as it actually got localized and released in america on the SNES in 1995. it also got a GBA re release in 2003 as a part of MOTHER1+2, a collection of, if you couldn't guess, the first two mother games! it also got another re release in 2013 in both japan and america on the wiiu virtual console, as well as one more re release as part of the SNES classic's library of games! as i said before, i own a fan translated copy of MOTHER1+2. i also own the wiiu version, as well as the version that was released on the SNES classic! people might also know of this game through super smash brothers, as the main character has appeared in every smash bros game to date! in the year 199X, a meteorite crashes on the top of a hill near ness's house in the small town of onett. along with his neighbors pokey and picky minch, he goes up to the meteorite where a fly named buzz-buzz tells him he is destined to defeat giygas! this is the same giygas/giegue from the original MOTHER, he's just gone insane and in buzz-buzz's time, finds something called the apple of enlightenment that tells giygas ness is destined to defeat him so buzz-buzz goes to warn ness that giygas is going after him! him and his friends puala, jeff and poo need to go to eight "my santuary" locations to learn 8 melodies (sound farmiliar?) and also along the way fight the animals and people and even robots that are being controlled by giygas before finally going back in time to when he was an infant and destroying him in his weak state by praying! paula prays to everybody theyve met and affected and even the whole world and those prayers hurt giygas and eventually kill him! eagleland is safe. ness sometimes gets so homesick he can't do anything in battles! this is a lot like ninten's asthma. there is a theory that a certain stage of the giygas battle, where he somewhat resembles a fetus, and some of the dialogue from that stage is based off a scene from a movie shigesato itoi, the creator, acidentally saw as a kid when he walked into the wrong theater. in MOTHER1+2 you can actually beat giygas without praying by poisoning him! mother3 is my favorite game in the series! its one of the only games i can give a 10/10 because thats just how amazing it really is. mother3 was released in 2006 for the gameboy advance and in 2015 on the wiiu, both of these releases are japan only. mother3 was never brought to america though a team of fans translated it fully so that is how many people play it. it was also bundled along with the limited edition mother3 gameboy advance micro system, along with a franklin badge! i am lucky enough to own a mother3 GBA micro, but i only got the box with the micro itself, the charger and the cloth sleeve for it as it was the cheapest available on ebay. i bought my copy of mother3 that included a franklin badge seperately! i'm still surprised by how micro it actually is, the screen itself is barely bigger than a GBA cartridge! the protags of mother3 are actually pretty different from both games before it character-wise, but not so much gameplay-wise. there's still a dedicated damage dealer, a bulky healer, one who cant use PSI (also called P.K. in mother3!) and a sort of all around/support character, that hasn't changed. you play as many different characters aside from the main four in mother3, but this section will be dedicated to those four! the main character is lucas a young boy whos world gets torn apart by the end of chapter 1, and he has to go off and not only find his missing brother, but pull 7 mysterious needles before the main antagonists, the pigmasks can pull all (or most) of them. in chapter 2 we play as duster , a theif with a handicap who's father wants him to sneak into ohsoe castle to steal the noble spitoon. along the way he meets kumatora the princess of ohsoe castle! the last character is boney lucas's dog who stays with him even during sections where you lose both duster and kumatora. i don't even really want to talk more about mother3 because if you want to play this game you need to go in blind. you should play mother3 knowing as little as possible, playing it that way is much better since i believe mother3 is more story-driven than either game before it. you don't even play half of the game as the main four characters!! in the prologue you play as a young lucas, in chapter 1 you play as lucas's father flint , in chapter 2 you play as duster, in chapter 3 you play as a freakin' monkey named salsa , and in chapters 4-8 you play as a combination of the main four, but you are always in control of lucas. its either all four, lucas and boney, lucas and kumatora, or just lucas. unlike mother1 and 2, in mother3 there are two characters on your permanant party that can't use PSI. duster who instead uses his theif tools to inflict status ailments on enemies and lower their offense/defense, and boney who has the sniff ability, which tells you an enemies elemental or status weakness! theres some unused flashback scenes that would have been even more heartbreaking had they been added to the game. my personal theory is these were meant to go in either chapter 6 as youre walking, or during the final battle. not much at all is known about earthbound 64 because it was cancelled during development. most of its ideas got used in mother3, like the town name tazmily, the main characters japanese name (ryuka) and probably the basic plot along with some other characters. their designs changed from EB64 to mother3 though and i feel like thats a good thing... the earthbound 64 designs for lucas, claus, flint and boney were kind of ugly and terrifying, even for a N64 era graphics. at spaceworld 2000 (a japan only nintendo event) there was a demo of earthbound 64 and after the pokemon gold demo got leaked recently it gave me a lot of hope that the earthbound 64 demo wil get leaked!!! i really want to see what this game would have been and how different it is from mother3! 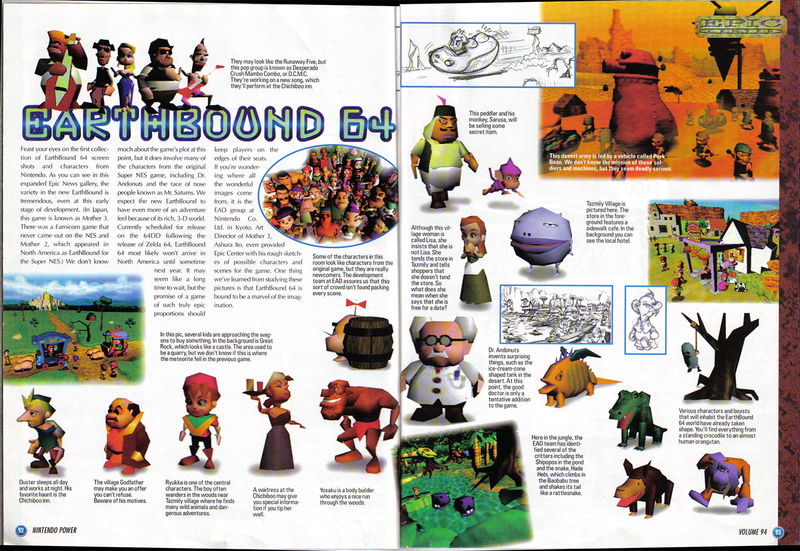 since i don't know much i'm just going to put my collection of screenshots from the only trailer we ever got of EB64, also here is an ad for it from a gaming magazine!